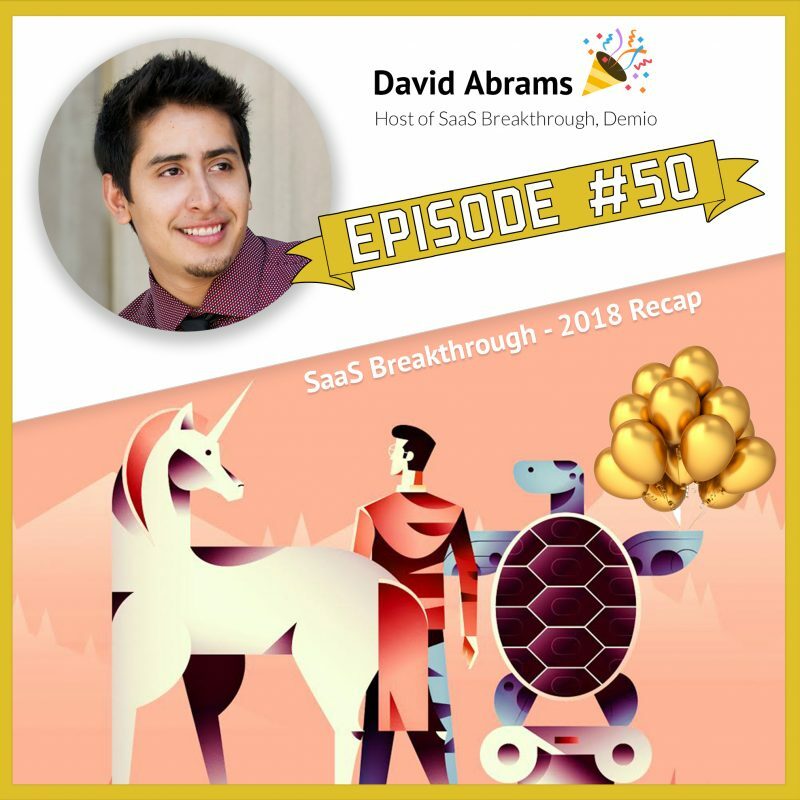 Welcome to this special SaaS Breakthrough 50th episode with our host, David Abrams, covering the 2019 SaaS Marketing Trends and Top Marketer Skills learned from our guests in the past episodes. I want to start by saying THANK YOU to you as a viewer. Thank you so much for listening, thank you for subscribing, commenting, and for being a part of this amazing journey. 2018 was a big year for Demio with a big revamp on our product, team and systems. We also as co-founders fine tuned our Vision for Demio and shared that vision in the events we attended and/or sponsored, like SaaStr and SaaStock Dublin 2018. It was a growth year and we couldn’t be more excited about what 2019 will bring on. As we get to the 50th Episode of this podcast, we felt it was a good time to collect the insights we have been getting from our amazing guests and reflect on what are the SaaS Marketing Trends for 2019. Personalization is one trend that several guest mentioned as something that will be strong in 2019. As more and more tools and features get launched, we should expect to be able to scale personalization like never before. It all starts of course with understanding and refining who your customer is, getting deeper on understanding your personas and perfecting the messages to those personas to get hyper personalized. There’s been this movement for Transparency, demanded from consumers and it’s now arriving to the B2B world. Businesses won’t be able to be a faceless brand anymore, people want to know who you are, what you stand for, what are your values. This is not easy to implement or embrace in all businesses, as it will require a culture change in many teams and leaderships. Another big key in 2019 is the Creator economy, which is booming. Whether as part-time or full-time, there’s more and more creators jumping online and the opportunities both for them and the companies that serve them keep growing. Every year brings on the next “new marketing tool” or “new marketing opportunity” but one that seems to be here to stay is SEO. Several of our guests continue to believe in the power of using SEO to grow your business and like them, we at Demio are doubling down our resources on this this year. What are YOU going to be working on in 2019 to scale or grow your marketing? Let me know in the comments! We have amazing things coming up in 2019 at Demio! Things like premium integrations, deeper integration at different higher end CRM, autoresponders, deeper engagement, analytics and insights, more of the functions and features that you need, and of course doubling down on this podcast, doubling down on great content that you absolutely love to digest, so we hope to hear from you in the future. I would love to hear your questions, your thoughts on what’s happening in 2019 in the state of SaaS. Let me know in the comments, I read them all.